This is a cloud based server for Collections MAX. This is so you can put your database in the cloud where remote collectors can access it remotely using Collections MAX Professional. WEBCONNECT is an optional online database hosting service developed by the Decca Software Company that allows your business to run Collections MAX software over a high speed internet connection without the need for a VPN. Users will be able to run the desktop software locally on their computer and be able to access the system database that is hosted online. This combines the benefits of both desktop and web based debt collection software into one integrated solution. Now administrators, collectors, attorneys, and clients will all be able to access the system no matter where they are located. This service is also perfect for those who need to use the software but do not have the resources to set up and manage the database. We install and configure your server and the hosting company manages everything for you in a turn key package. $295.00 one time setup fee per server PLUS $12 to $96 per month depending on which hosting package you choose. This service puts your server in the CLOUD! A major benefit of a Web Connect Hosting Plan is that you DO NOT need to have a server in your office! Only a high speed internet connection is required! We utilize high quality, super fast private servers for our web connect hosting. Your data is never commingled with other agencies and you receive your own static ip address for your server. Just think of some of the possibilities. You can run a collection agency with remote collectors from anywhere in the world. An Attorney can log into the system and work any legal accounts assigned to him. You can run more than one office without complicated VPN hardware. You can outsource your accounts without them ever leaving the system. This service also installs the Collections MAX Scheduler to automate your database. The Scheduler can run the built in automation program, mark broken promises, schedule pending postdated payment letters, calculate interest, and make a complete backup the database every night. 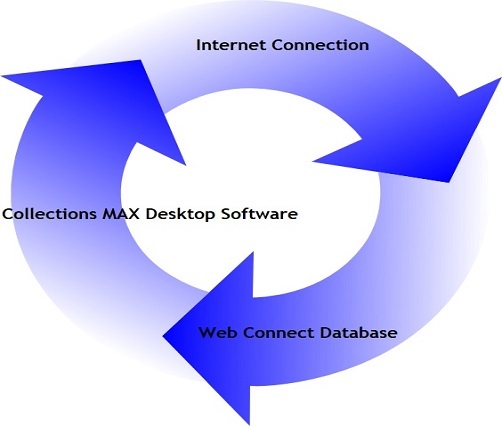 You will need to purchase one Collections MAX Professional license for each computer that will be connecting to the Web Connect hosting service. After purchase you will receive an email on how to setup and purchase your hosting from our approved hosting provider.